Independence day on August 15th was celebrated with the idea of bonding children to the ideas of patriotism and love for fellow humans. Our National flag was hoisted and the National Pledge was given by Tharik from the Std I, who led the school march past this year. 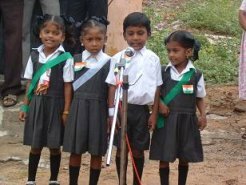 Children from the I standard gave a speech in unfaltering English on Mahatma Gandhi. UKG students explained the importance of Independence Day to one an all. What was so endearing was their fluent English to the surprise and happiness of their parents and the discipline with which they went about the whole show. It was very satisfying to see the well-mannered kids on the occasion. These kids will definitely make their country proud one day! Parents-Teachers meeting held this August was a run away success. We had parents interacting on a very deep level. They found our way of teaching most satisfying and also complimented us for our play-way activities. The discussions went further and we found that except for 1 mother most parents were using corporal punishments to discipline children. And most of them accepted that they vented the everyday frustration on their child with a tight slap! However, they were open to ideas, and accepted that if they could be a little more patient and explain things to children the way it should be, it would result in more disciplined children. We had Karen, Paul and Jordon all the way from California who volunteered their time to work in our school. It was a wonderful experience for all of us...they did quite a few work shops for our children and one of the workshops was teaching computers for our 6 year olds! 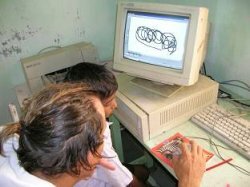 The first batch of our computer classes for village youth has come to an end. The students from NUS (National University of Singapore) and THE SCHOOL KFI, Adyar, who had volunteered to do the entire training, have done an excellent job. Our students have picked up very well and it was quite astonishing to see youth who had never used computers before, enthusiastically picking up computer jargon and playing with Word, Powerpoint, Excel, etc. The children are also having fun by way of Shorinji Kempo training - whole-hearted thanks to Maxwell Senseii! Mr. P C Vinoj Kumar, who has given our work a great review. Our THANKS to him to have taken the trouble to help us help our children. We hope that more and more people will join us through his writing. We are now looking at buying land for school (around 2 acres) and are looking forward to your continued support. UWCSEA Singapore and Yogoda Satsanga Society of India, who have always stood by us, are extending their support by helping us with the school building, as part of their Tsunami rehabilitation efforts. We hope more corporate/ individuals will extend their support towards building a permanent structure, and sponsoring a school bus for the school and help make a positive difference to these children. Thanks to all of you for making this school take shape. We have plenty of work ahead..... and I am sure we will rise to greater heights through your loving participation.